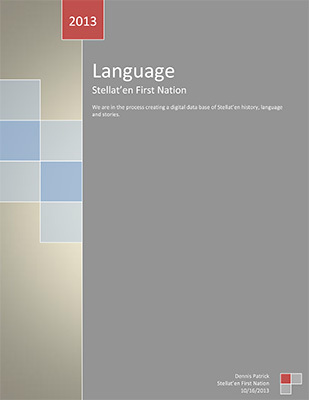 We are in the process of creating a digital data base of Stellat’en history, language and stories. Project lead is Dennis Patrick. Click on the image at right to download the report and let me know your comments or if you want to contribute. Email me here. The ability of people to speak the language of their identified ethnicity is an indicator of the ability of ethnic groups to retain and pass on their culture and traditions to future generations. Language is a central component of cultural identity.